Even a low-poly fictional dog can make me a little weepy, because I'm a giant baby when it comes to animals. 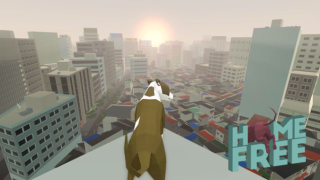 Tugging at my heart strings today is Home Free: an open-world game in which you play as a stray dog. "You are a dog, lost in a sprawling and unfamiliar city," writes developer Kevin Cancienne. "You wander the streets, searching for scraps, for shelter, for a friendly face. Slowly, you overcome some of your fears. You learn where you can snag a meaty bone, where you can sleep warm and safe at night. Strange streets become familiar territory. One by one, the streets become yours." The game will also ship with a multiplayer "dog wrasslin" component called Dog Park. Various dog breeds and colors are included in the game, but most important is the GIF of a Shiba Inu sitting on playground equipment below. Home Free's crowdfunding effort launched this morning and has already raised $12,000 of its $50,000 goal. At this pace, it's likely that stretch goals such as "Cats" and "Tiny Legs" will make their way into the game. Keep an eye on this one. Keeeeeep watching. Stay. Staaaaaay.